Following a month of sumptuous celebratory feasts, during which our dining room tables groaned under the weight of our festivities, we naturally gravitate towards a return to balance. We seek out lively and clean flavors to reset our taste buds and brighten the dull winter days. 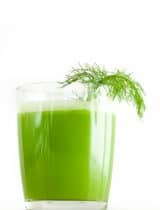 Fennel, celery and apple are such wonderful partners in this endeavor and offer a welcome respite from the heavier foods of late. 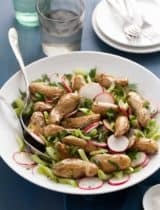 Crispy, crunchy and light, they combine to create a winter-time salad that brings a little cheer to a dulled post-holiday palate. While celery and apples are household staples and beloved snacks that make the shopping list most weeks, fennel is not always so well loved. Slightly sweet and crunchy, fennel has a fresh assertiveness all its own. Its subtle anise flavor is beautiful all alone, but its greatest asset maybe its power to blend with and enhance other foods, adding lively layers of flavors and texture. 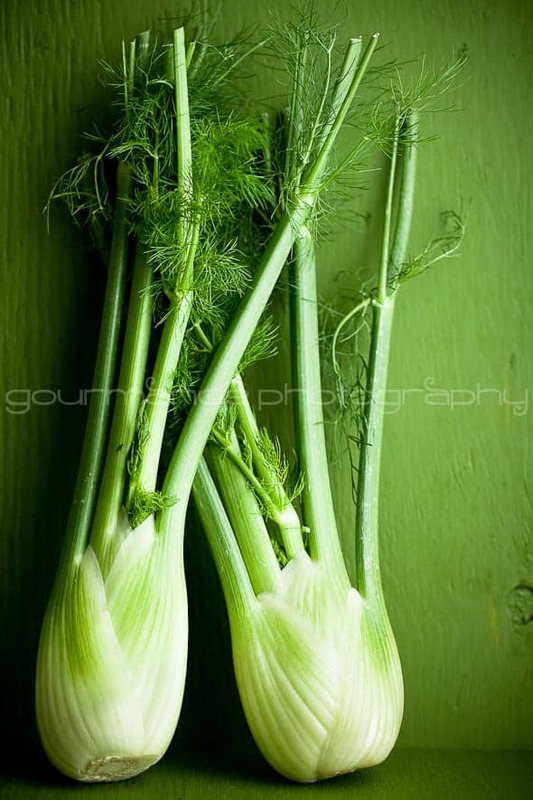 Long prized for its digestive properties, the anti-inflammatory properties of its essential oil anethole and its vitamin C content, fennel is a versatile vegetable worth getting to know. 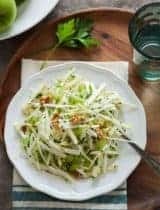 This shaved fennel, apple and celery salad may just sway a few fennel fearers into fennel lovers. Slight tart apples, shaved paper thin are combined with fennel and celery in a delicate mess of winter white. 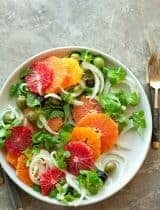 Dressed simply with fresh lemon juice and extra-virgin olive oil for a fruity and peppery bite, a gentle sprinkle of fresh parsley and mint finishes off the salad and adds a touch of fresh flavor and color that might almost make you forget how many weeks of winter still remain. 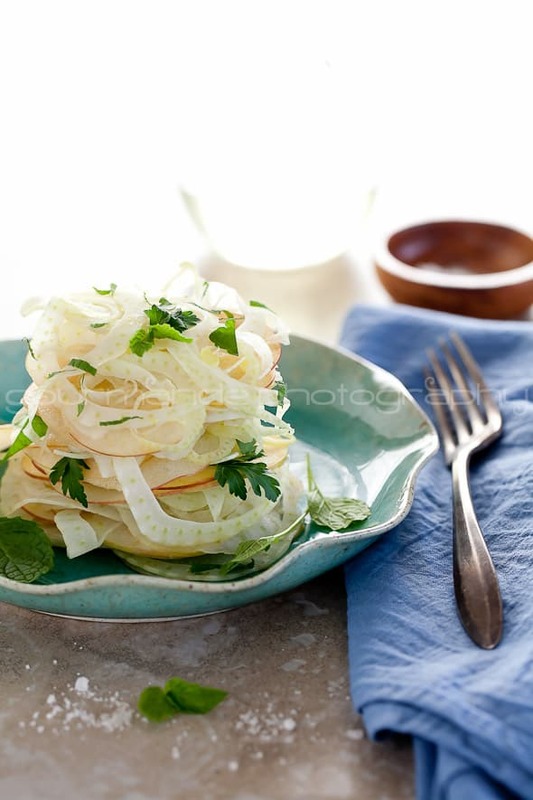 Slight tart apples, shaved paper thin are combined with fennel and celery int his light and refreshing salad. 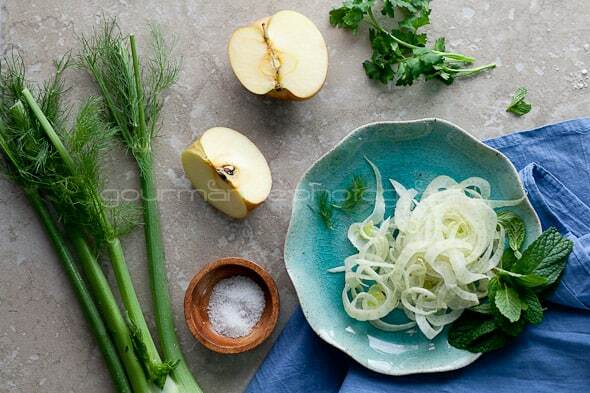 Combine celery, thinly sliced fennel, apple, parsley and mint in a medium sized bowl. Drizzle with the olive oil and lemon juice and toss gently to coat. What are your favorite post-holiday meals? What a coincidence, just had some apple salad today sans fennel though, now ur inviting pic is making me try out fennel for next time, gorgeous! Such a light, pretty salad. I really should use fennel more often. I really love fennel. You make it look prettier than when it is in the crisper of my refrigerator rhough! Really a welcome salad of mild flavours after the festive over indulgence...lovely pics, as always!! this sounds so refreshing and looks beautiful! Beaucoup de fraicheur dans le plat, de la douceur dans les photos, une parfaite façon de commencer l'année! This dish is simply beautiful and so fresh and clean looking. I just used fennel for the first time in a pasta dish and found it's so easy to cook with and it added a nice balance and crunch to my pasta dish without overpowering it. I discovered fennel last year. I made a chicken dish that was accented with fennel and artichokes. I really didn't know what to make of the recipe but I really enjoyed it. Your 'wintery white' salad looks beautiful and fresh! This sounds amazing. Believe it or not I actually have fennel in my crisper, bought it for something or other and haven't used it. I have all the other ingredients as well. Guess what I am making for lunch. Thanks and your photos are lovely. Gorgeous photos and recipe Sylvie - as always! Such a refreshing salad. Mmmm I love these flavors and I can actually envision eating this delightful, flavorful, cool salad all summer long. Perfect! I love the cleansing, healthy quality but the flavors are fabulous! This looks absolutely too pretty to eat! :) Great flavor combination - I'll have to try this soon. 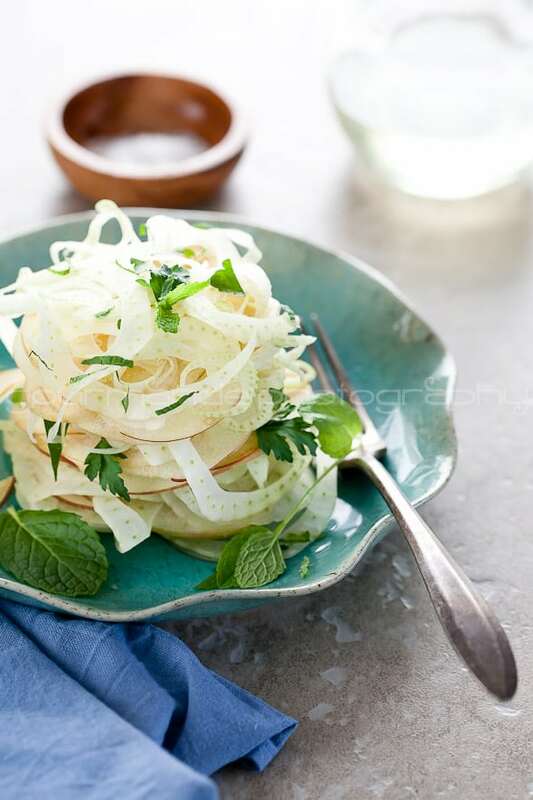 Love how light and white this salad is - so pretty with such thin layers of fennel, apple and celery. Sylvie! This is lovely (not to mention drool-worthy). Every time I visit your site, I fall in love with photograph all over again. Just beautiful. This is one of my fav salad combination. Apple with celery.. crunchy and fresh at every bite! What a beautiful salad and you make it even more so! Your photography always just makes me sigh it is so gorgeous! Gorgeous salad Sylvie! I'm loving the blue and green color palate too! 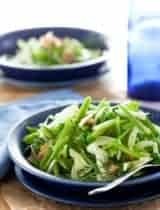 Love fennel in salads...I just read an article earlier today by Danielle Omar in the Washingtonian about fennel....Must be a sign to go buy some! I'm another lover of fennel here. I always keep it around in the winter months to add to soups, braises, and of course, salad. My favorite salad is similar to this, but I swap out the apple for radishes and serve it on a bed of smoked salmon. Try it sometime! I adore your photography! ALWAYS! Though, I have to say - I really love your recipes and this one is so simple, healthy and beautiful! This is just my kind of salad: light, crunchy and full of flavor! We eat fennel with citrus all the time; apple will be a nice change. Such a lovely and refreshing salad. At our holiday dinners when I was growing up my family always served fennel stalks at the end of the meal. It was said to clean the palate and aid in digestion. I love you photos! This looks fantastic! 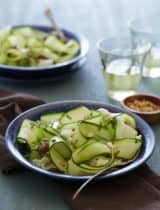 I'm one of the none lover of fennel, but with this salad...I think I could make an exception! I just put this salad together. There were so many great flavor contrasts. I especially liked the addition of the mint. Not sure how you sliced everything so thin so my presentation was not as elegant pictured salad. Great! I'm glad you enjoyed it. I used a mandoline to slice everything superthin like you see in the picture. Such a beautiful salad! I really need more salads and soups after the holidays! I love the color palette, the crunchy texture of this salad and the way you layered them all on the plate. This light, fresh dish would be welcome in my kitchen. not just like the flavor palette combination but how you arranged it, it definitely makes this healthy salad more appetizing. I love fennel. It's one of those vegetables that is so refreshing and good either raw or cooked. The salad looks delightfully put together. I couldn't agree more.... I'm all about lighter fare now. This salad looks marvelous! this is exactly what I need to revive me at lunch. autumn, winter, spring or summer. you should be given a medal for you photo of the fennel against the green wall! A wonderful light set of flavours to clean out the palate after the holidays! I have been on a raw diet for some time with occasional soups thrown in. I love these fresh flavours in this salad. Refreshing. I am starving for some light and healthy food after all of this over eating. Thanks for sharing this wonderful recipe! So strange. I was talking about balance (of a different kind) :> I love fennel salad! I have always paired them with sour orange slices. But apples will be fabulous, too. Oh what a beautiful salad and perfect after all the excesses of last month! I think even my dad, an avowed "non-salad" eater, would enjoy this one. Gorgeous! I am always amazed by how much fresher your produce looks :-) Ever since I saw a version of this in Donna Hay's newest cookbook, I have been wanting to try it out .. but always forget the fennel! doh! I agree with Kulsum about the green on green .. beautiful! I am on a detox or at least very light diet now. This is just perfect and I love the fresh mint here. I am eating mostly salads, but mine can never look even half as good as yours. Love the Anthropologie plate! what a beautiful salad. I am looking forward to trying this one out. Love your pics too. 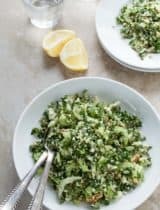 I love fennel and this salad sounds so good not to mention it looks so beautiful would be so hard to resist the temptation to dig in. Absolutely gorgeous and perfect for January - that shot of the fennel is AMAZING! Gorgeous salad Sylvie!!!! So clean and fresh. I love fennel, especially roasted, but it's so great in salads too. What a stunning and healthy salad! I adore fennel and this is the perfect dish to let the flavor shine through! This is a great way to kick start the craving for healthy + fresh flavors. Such a pretty way you styled this salad too, love the tower. I absolutely adore this flavor combination...stunning salad and photos! What a stunning salad! I wouldn't have thought of pairing fennel with apple. i can't wait to try this. I agree-definitely into the lighter side of food right now, and I love a good winter salad. I love hearty, veggie-packed soups that fill me up on cold days! I'd get excited about that gorgeous salad any day of the year, though! so pretty and I LOVE how it's all sliced, just beautiful! I love this salad. Serve me apples and fennel together and I will take it anyway! WHat a beautiful and completely tempting salad - so light and so welcome after all the holiday feasting! What a beautiful, light and gorgeous salad. Exactly what I need right now! I made this for dinner and it is unanimously a new favorite. Absolutely delicious. Thank you. This looks inCREDIBLE! I can't wait to make it. 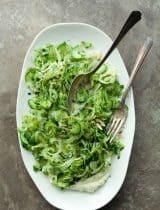 How did you get the fennel and celery sliced so thinly in strips as seen in the photos? The texture looks mouthwatering and I very much would like to reproduce it if possible. Thanks so much for the incredible recipe! I used a hand held mandoline like this one to shave both the fennel and celery. That shaved apple, fennel, and celery salad looked soooo good, I had to try and make them. I used your suggestion and used 2 Tablespoons chopped fresh mint.